Islamists across the globe are hailing the victory of Muslim Brotherhood candidate Mohammad Morsi in Egypt's presidential election, particularly Hamas and even traditional Egyptian rivals like Iran. In the meantime, as Israeli and American officials have responded optimistically but cautiously to Morsi's wishy-washy statements on Middle East peace, some American Islamist officials have already started a propaganda campaign celebrating the Islamist victory. During his victory announcement, Morsi pledged to be a "president for all Egyptians" and to honor international treaties, code for preserving Egypt's cold peace with Israel. But within hours, Iran's Fars News Agency claimed that his government would "revise the Camp David treaty" in favor of a "policy based on equality, since we are not weaker than them in any field." Fars also quoted Morsi as saying that the move would be coupled with better relations with the Iranian Islamic Republic, Egypt's traditional rival in the Middle East and Israel's most vocal enemies. The new relationship would "create a balance of pressure in the region," Morsi said, in what seemed a veiled threat against Western interests and the Jewish state. In addition, Iran's government praised the "Islamic Awakening" represented by the Brotherhood victory. Its military addressed Egypt's military directly, calling "on all Egyptian Armed Forces to welcome this divine blessing with open arms and play their effective role and share in the establishment of unity and building future Egypt based on Islamic foundations, independence and freedom." Morsi denied the Fars interview shortly thereafter, and did not openly reciprocate support for Iran's positions. The Christian Science Monitor took note of the "political circus" and conflicting statements, wondering whether Morsi intentionally was "adjusting his comments to suit his audience." In his victory speech, he claimed that although he would not attack Israel immediately, he promised to push the Palestinian issue with the Jewish state. This will undoubtedly mean more influence and support for Hamas, the Palestinian faction allied to, and championed by, the Muslim Brotherhood. Hamas-run Gaza burst into celebration at the news of Morsi's victory. "We will look to Egypt to play a big, leading role, a historic role, regarding the Palestinian cause, in helping the Palestinian nation get freedom, return home, and totally end the Gaza siege," said Ismail Haniyeh, head of the Hamas government. Hizballah also congratulated the Brotherhood, stating its hopes for a greater Egyptian role "in defending the causes of the nation and shaping the future and the fate of the region." In the United States, the Council on American-Islamic Relations (CAIR) hailed the victory. "We congratulate the Egyptian people and their new president on this great achievement in Egypt's struggle for freedom," said CAIR National Executive Director Nihad Awad in a Facebook posting. Other CAIR leaders saluted the Islamic regime and its ability to liberate Egypt from American interests. 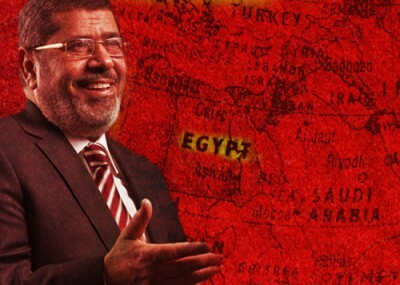 "Get ready for regional and Western forces' plans to undermine President-elect Morsi. We've seen this playbook before," said CAIR-Michigan director Dawud Walid. "While you're so concerned about how Morsi will govern in Egypt, you are loosing [sic] your democratic rights in America." "Dear america: read, watch the arab world die for freedom from u.s. proxy-imperialist (colonialist) wrath, [sic]" said Lamis Deek, a board member for CAIR-New York. "Arab-democracy=US govt hands off," she claimed, before comparing the Egyptian revolution to the "the still warm blood of Palestine." The Obama administration congratulated Egypt on its successful democratic process, while announcing its expectations for the new regime. "We believe it is essential for the Egyptian government to continue to fulfill Egypt's role as a pillar of regional peace, security and stability," said White House spokesman Jay Carney, adding that the U.S. believed in the importance of "upholding universal values" and respecting the rights of all citizens, particularly women and minorities. Israel's official response was warm if cautious. "Israel appreciates the democratic process in Egypt and respects the results of the presidential elections," said a statement from Prime Minister Benjamin Netanyahu's office. "Israel looks forward to continuing cooperation with the Egyptian government on the basis of the peace treaty between the two countries, which is a joint interest of both peoples and contributes to regional stability." But other Israeli diplomats had a more negative outlook. Former Israeli ambassador to Egypt Zvi Mazel said that he expected a "gradual freezing of the peace treaty," and less room for Israel to operate in Gaza to counter Palestinian terrorism. In any case, the Brotherhood's victory is bad for Israel and the West, writes Barry Rubin. America's liberal media and political elites have ignored the group's outspoken rhetoric, choosing to listen to moderate statements even as they are accompanied by extremist internal quotes. "They ignore the fully documented fact that al-Mursi campaigned on a basis of hatred for America, fundamentally transforming Egypt into a Sharia state, going to war with Israel, and spreading revolution throughout the region," he states in an article for the GLORIA Center. "It is time, though, to start thinking of U.S. interests."